The Sun is officially in tropical Cancer and this is a season of love, relationships; internally and externally. It is about finding balance between your needs and any relation you are in, whether it is friendship, with colleagues or lovers. 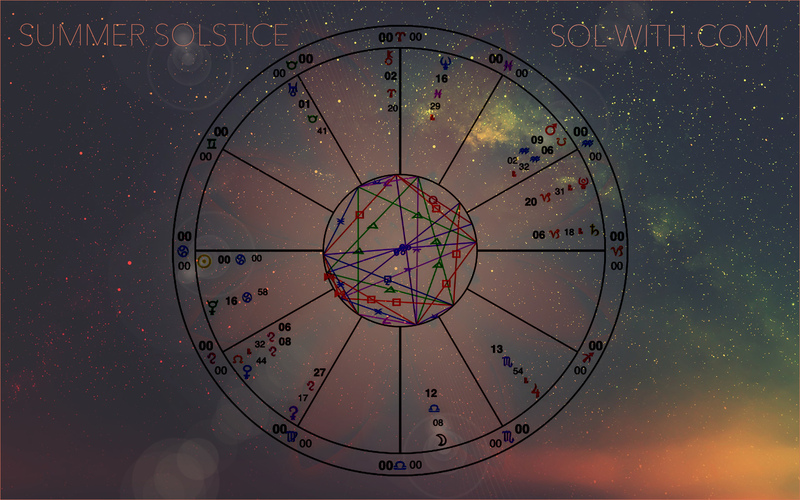 The Solstice chart has the Moon in Libra in contrast to the Sun in Cancer, making this theme very clear. Cancer is all about finding your own rhythm, finding that place of honest listening to what is your particular needs. The Moon in Libra point to the tendency to set aside own needs to meet the need to always have peace. They are contrasts and with contrasts comes paradox. Paradoxes are always tricky. How to achieve balance between freedom and responsibility, between honesty and strategy, between connection and detachment and so on and so forth? 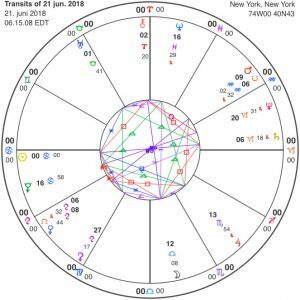 This chart has both relationship planets highlighted on the lunar Nodal Axis and pushes this theme further into focus. Venus in on the North Node and Mars on the South Node. And we might find us in situations where we have to either please people to survive or confront them to survive. A lot of people pleasing has its fundament in a deep, inner need to always have harmony around us, and have people love us. So we then try to change others to be in a happier place, so that they won’t disturb our need for harmony and peace. We apply WILL (Mars) to get PEACE (Venus) but for a price that can have consequences for us further down the road. When we express our Mars; our raw, instinctual nature, our warrior, our anger and passion – we might run into fear, people trying to calm us down or tell us to be quiet. They fear this strong energy, fear it to tear down a house or wreck a place. Or to be violent. It stresses them that anger is expressed. There is no training in this arena of life, being perhaps brought up in an atmosphere that carries an attitude that all anger is violent. Some problematic political correctness. Maybe they have experienced the violence or darker sides of Martian energy, which can be an individual who tries to control the environment through anger, in the style of “if I can’t have my will, I will create hell on earth!”, and they are traumatized or humiliated. We all have anger inside, sometimes because we feel deeply powerless and have “lost” to a greater opponent. Sometimes because people have done wrong towards us in other ways. Sometimes because we didn’t get what we wanted. So depending on our general nature, our energy psychology, and our upbringing and cultural conditioning, we either hold space for that energy, we exaggerate it, or we suppress it. A healthy Mars is a protective quality within a human being that is capable of saying “no!” in such a way that there is no doubt about their boundaries. A Mars expressed without fear has that kind of power. You just don’t mess with these people. Not because they will knock you down, but because they are not possible to violate. They have moved beyond co-dependency and whatever manipulations they meet, whatever people try to scare them into, they know that I rather want to be alone than in an abusive situation. We will all have a bit of a chance now to strengthen our boundaries, stand up for ourselves and take responsibility for our true nature. No more avoiding difficult issues. And that with a little help from darling Venus. The lubricant of love and understanding. It is amazing what you can express if you take full responsibility for how you feel and that you put yourself in situations that requires you to be aware, awake and conscious of yourself and others. If people notice that you are beyond judgement, that you don’t play the blame-game, they don’t see the need to be defensive AND they manage to take constructive feedback. This is a very difficult exercise for humans, if it hadn’t been, we wouldn’t have so many divorces. The lack of true communication is a huge problem. People just go to war. Venus is, however, a lover of higher states. She prefers to be in peace and feel great, and the Goddess Venus really loved it that others loved her. “Who is the fairest of them all”- who among us are educated and civil, capable of transcending such tedious feelings of separation and conflict? The greatest weakness for Venus is exactly that need to be liked by all. Not everybody gets you. That is just a fact. And if you are unafraid and expressive, people will react. In psychosynthesis they talk about a concept called “the will to be yourself”. And to be the authentic has a consequence. If you don’t always play into people’s expectations, you might experience that they don’t like you. People like to have their way around each other. However, it is easy to respect people who are honest and transparent. You know where you have them and what is going on inside of them. You sense their boundaries, and then it is easy to relate.. If people are passive-aggressive, it is almost impossible to relate. You have to pry into them to try to figure out what the hell is going on in there, picking up vague signals and attempting to get a clear picture. With Venus so strongly on the North Node on the Moon for this Solstice, we get an impression of a Venus that is courageous enough to love herself (or himself) and expressing what goes on in the heart. Healthy relationships manage that unconditional love of giving each other freedom, stay away from attempting to change each other because we feel uncomfortable or annoyed, and if difficult situations arise, there is enough capacity to stay grounded in the self and at the same time be empathic towards the other. Have a beautiful summer people. Enjoy life! Don’t let bad habits ruin it.